I remember the frustration of trying to shower when having my first child. A shower was a luxury. But only luxurious in the sense that it didn't happen every day. Because the actual shower was anything but luxurious. It was stressful, rushed, and always unknown as to whether or not you would be able to finish your whole shower routine. Oh how times have changed. If I want to take a shower, guess what? I go and take a shower. For as long as I want. In fact, I often find myself in the shower giving myself a pep talk to get out. To go get other things done. To be productive. And not to mention- to be responsible. Like- go take care of your kids. But in the shower there is no whining, no requests, no refereeing. It's nothing but peaceful freedom. And that is a hard state to push yourself out of when not obliged. This was shower time the other day. Baby girl passed out on the floor. Please notice that I did put a nice, cozy blanket down for her that may or may not have been washed since then. But while she rested, it was a clean surface. Half-dressed? Yes. Because in my mind I was like, "Should I shower her or not shower her?" "Should I change her clothes or leave her in her pj's?" Can you guess the results? No shower and stayed in her pj's all day long. You win some, you lose some. 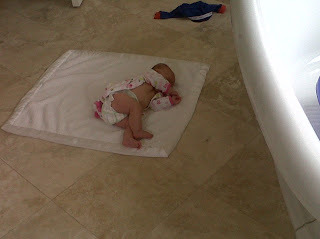 Just like last Saturday when Kaia found herself in the same position- lounging on the bathroom floor. She's all sprawled out on her back. I go to wash the Deeter Bug off and turn around only to find her Supermanning it on her tummy. Kaia did her first roll over. In this case, I was the loser. Add this to the top of the list of "Milestones Mom Missed." I'm sure there are a ton to follow. Deeter showered with me and was then left at the Water Park to be entertained while I got ready for the next 15 minutes. And guess where I found his naked booty about 5 minutes after getting him out? Squatted in his bedroom corner. I'm probably jinxing myself by admitting this but I can count on one hand the number of times I've had to clean up poop and probably throw up too. My kids have me spoiled. Deeter better be lucky it was a fresh, easy clean-up! Glad that like to play together. And with it being a game of Monopoloy it looks like I might have gotten trapped in the shower for a good 30 minutes. 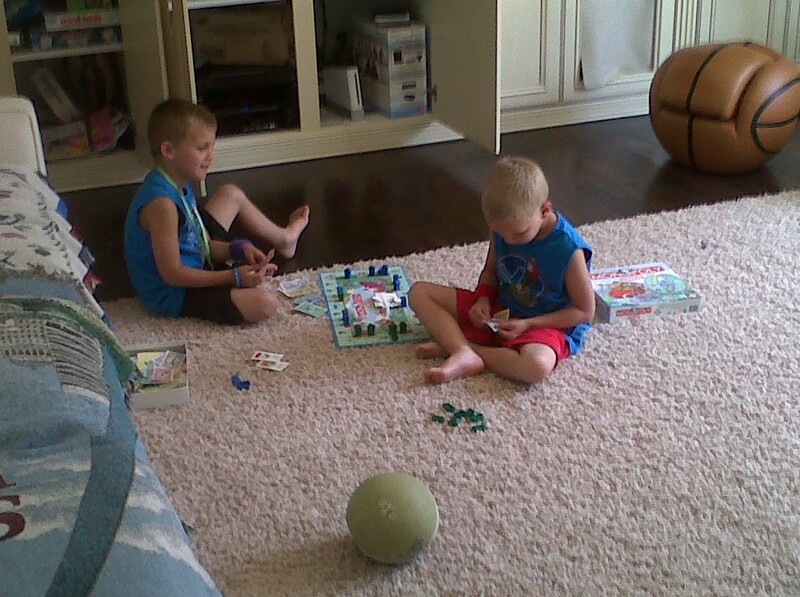 Teach them young to entertain themselves! Oh my heck they are all so cute...oh the picture of deeter in the shower...love it. and the blessed shower.....my little safe haven. Love your darling family of 4.